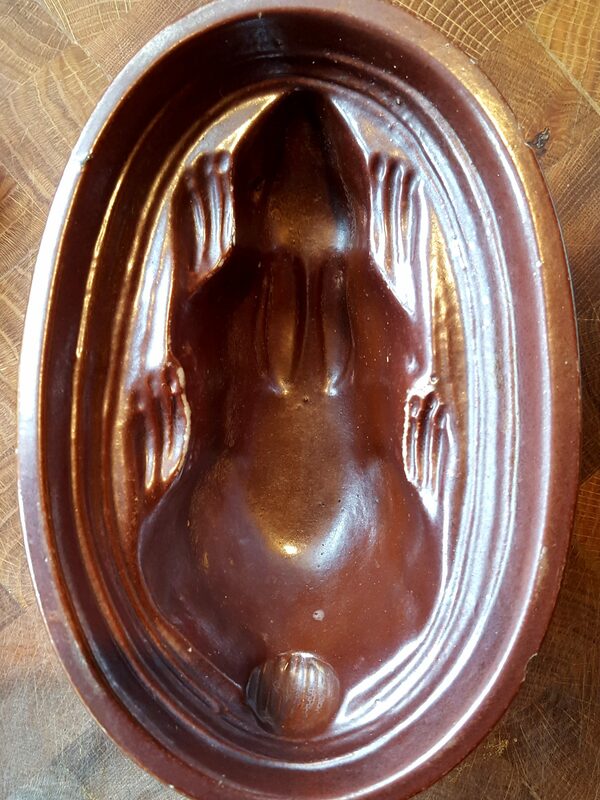 When I decided to make a rabbit and ham terrine for Easter it made perfect sense, I thought, to use the old bunny-shaped earthenware mould I had in the cupboard. It wasn’t one of my better ideas. 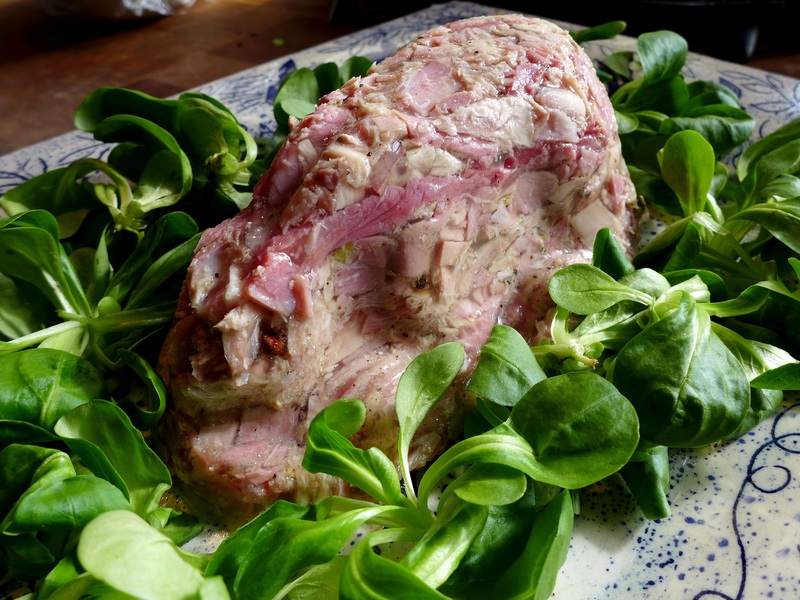 Still, it tasted good and as you’re far more likely to have a loaf or terrine tin handy, I’ll pass on the recipe. I used a gammon hock weighing just under half a kilo and the saddles and hind legs of two wild rabbits. You can, if you prefer, make it entirely with ham, in which case flecking it with finely chopped parsley would be a good idea. Just mix it in with the diced meat. 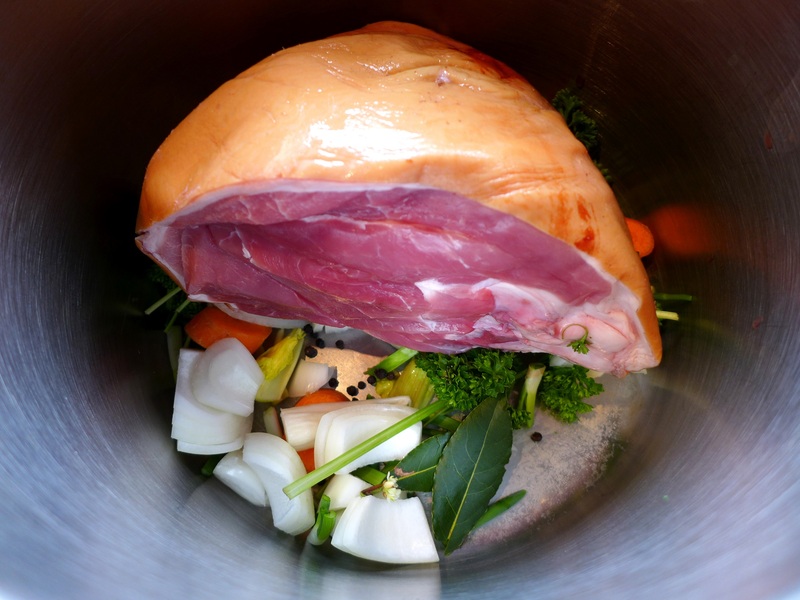 Peel and roughly chop the vegetables and put them in a stock pot with the herbs, peppercorns and ham hock. Cover with cold water, bring to the boil and simmer for an hour. Don’t add any salt at this point. Add the rabbit joints and the wine and cook for another 45 minutes or until the meat is tender. Remove the meat from the stock and set aside to cool, then dice most of the meat but cut the better pieces into long thin strips. 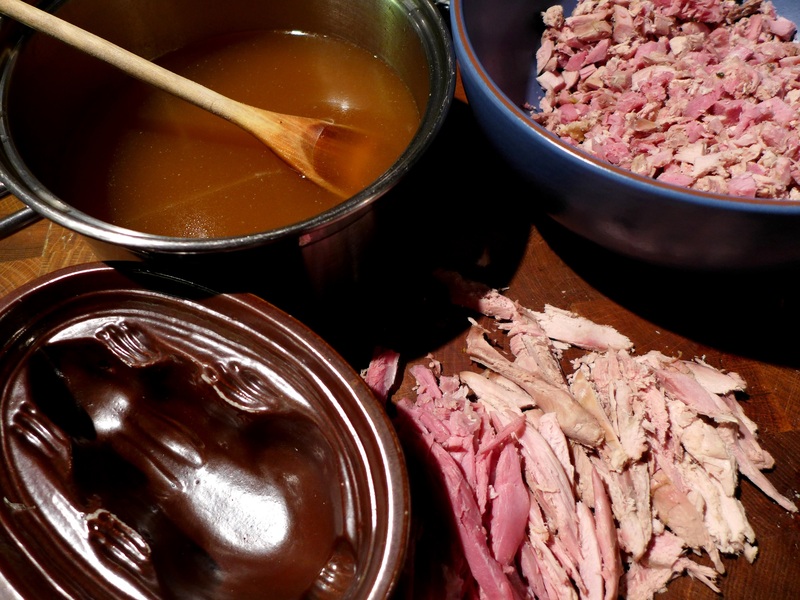 Mix the diced ham and rabbit and check the seasoning, adding more salt and pepper if necessary. As you’ll be eating this cold, err on the side of stronger seasoning or it’ll taste insipid. 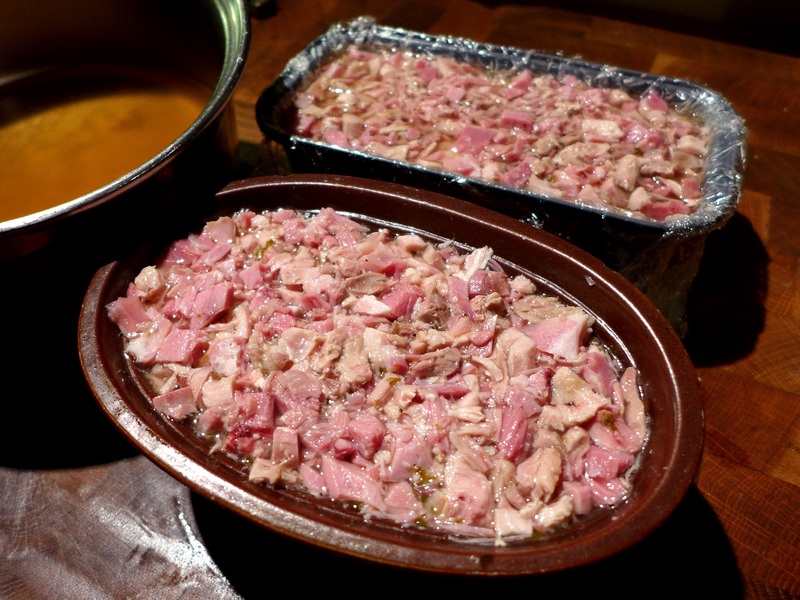 Strain the stock, pour it back into the cleaned pan and reduce by about half … until the stock has intensified in flavour. Check the seasoning but you’ll probably find it’s salty enough. Follow the instructions on your gelatine packet … leaves will need to be soaked in cold water for 10 minutes. When they’ve softened, squeeze out the excess water and put them in a saucepan with the litre of stock. Heat until the gelatine has dissolved. Line two small loaf tins with cling film and put a layer of chopped meat at the bottom. Dribble over a little of the jellied stock. Cover with a layer of sliced meat and repeat until you’re nearly at the top of the terrine, ending with a layer of diced meat. Press down to ensure it’s all covered by the stock, and then chill in the fridge until set, preferably overnight. Unmould onto a plate and cut into thick slices. It makes a good lunch or starter with pickles and chutneys, a green salad and some country bread. Just don’t use a bunny rabbit mould. This entry was posted in Game, Mains, Pork, ham and bacon, Soups, starters and canapes and tagged rabbit and ham terrine by Linda Duffin. Bookmark the permalink. Oooh, he is a bit scary. I thought you were going to say you couldn’t turn it out. That’s always the problem for me with those fetching old earthenware moulds. I don’t seem very adept at the cling film thing, and if I warm the earthenware ‘just enough’, it’s always far too much. Gloop. I could make this, and pretend to ‘im indoors that it’s chicken, non? Oh dear, yes I see what you mean! Specially for those of us who are squeamish about bunnies and like to think of them frolicking in the fields! Nonetheless, the terrine sounds delicious. I am laughing out loud!!! It does sort of look like a skinned bunny. but i bet it’s good! very scary and really rather funny. Almost reminds me of one of those funny early 70s food photos. Would just need to be surrounded by chopped aspic or something similar. I’m not keen on rabbit ever since i got food poisoning from a dodgy rabbit pie but i like the idea of making it with chciken instead. That’s hilarious. I bet it was delicious though. Oh Lor, that has made me chortle! Have you given it eyes or am I imagining that?! I am still entry-level when it comes to bunnies but I do love anything made from ham hock. Yes, cloves for eyes but in keeping with the whole diseased aspect they kept falling out. 🙂 The terrine really did taste good though.